I very clearly remember when I started drinking coffee. It was right after my freshman year of college, when I traveled with a small handful of classmates down to Atlanta for an ecumenical conference on youth and young adult ministry. I was going through a season of discernment and questioning related to my faith, and experiencing this event with trusted friends going through similar times of transition was exactly what I needed. The morning after the conference ended was an early one. We'd driven a van down from northwest Ohio and wanted to make good time for the journey back. Confounded by the hour at which I'd awoken, I poured myself a cup of coffee in the lobby of the hotel and awaited our departure. It's worth noting that this particular hotel was set in the downtown area of the city; a large, upscale place in which the conference itself took place. The coffee, no doubt a brand of finer quality than Folgers, reflected the setting. While many deem this caffeinated drink an "acquired taste," I was hooked from the first sip, grateful both for its assistance in perking me up for the day and for how it satisfied my taste buds. That first cup helped set the tone for my appreciation of coffee that is rich, well-crafted, and a step above the stuff in the metal cans that is so popular among so many. I tend to opt for smaller brands, particularly those under the Fair Trade label: coffee that is handled with more care and distributed more justly, and with nary a drop of cream or grain of sugar. Some might call me a snob, but I like to think that it's an appreciation for quality over convenience. 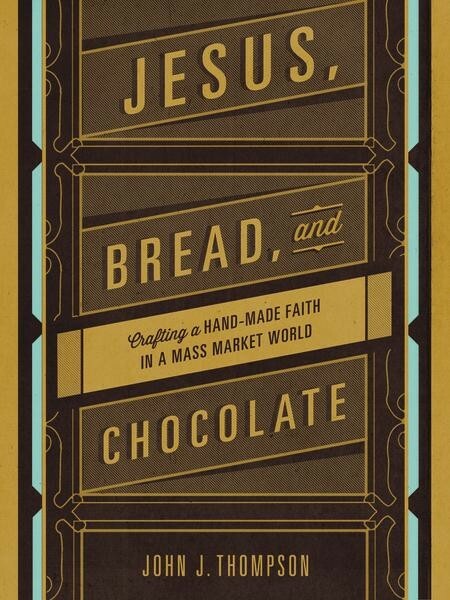 Such an appreciation is at the heart of Jesus, Bread, and Chocolate: Crafting a Handmade Faith in a Mass-Market World by John Thompson. Thompson is a musician: he got in on the ground floor of the Cornerstone Christian music festival, has played or sat in with many CCM artists from the industry's heyday, and owned his own music store, venue, and booking company for a while. He has an ear for talent, but also a taste: he's a fan of local artisan production of things like bread, chocolate, coffee, beer, and vegetables. In fact, he has a chapter devoted to each of these, which help build his premise that versions of these that are hand-crafted by careful experts who love what they do are inevitably better than that which is mass-produced and injected with extra chemicals in the name of expediency and convenience. Thompson sets about exploring each of these products by talking to experts in the field, giving a brief history of the product, explaining some of the nuances in how artisans go about their craft vs. how it is done in large factories, and ultimately why it matters. The basic argument, as one might expect, is that the stuff that is handled with care and more attention is higher quality, and worth the extra time to seek it out, as well as the extra money to purchase it (or the extra energy it would take to learn how to do it oneself). The inevitable tie-in, usually near the end of each chapter, is how this care and attention relates to a life of faith. Thompson reflects on the ways Christians have turned faith into a commodity; the way many churches have turned it into a mass-produced, one-size-fits-all product injected with many unnecessary things that cheapen it and make it unhealthy. He laments versions of faith that have lost a sense of community, or that have otherwise taken on the consumeristic mindset of empire rather than reflecting the values of God as shown through Jesus. Like roasting coffee and brewing beer, this commentary is subtle. Thompson does not really approach this piece in an overt manner, with long diatribes against the practice of religion as it is known in many places around the United States. He is more concerned with showing the reader something about the difference it makes to slow down, strip away the excess, and see what goes into making something as good as it can be without additives. Usually his comparison to the journey of faith is simply to ask, "Do you see how things could be different if we approached everything else this way? We don't need the extras. How much better could things be without them?" 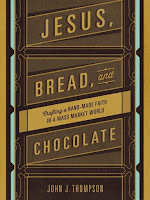 At one point, Thompson notes that if one takes the time to give special care to making one's own bread or chocolate, it inevitably affects other aspects of life. We start slowing down in other ways, and giving greater attention to other things. He suggests that this should include following Jesus, and does so in an understated way. For the most part, he allows the reader to make those connections themselves. I've read my share of overt commentaries; as a pastor, I'm destined to read more. Many of them make the same points, which are well-taken. Thompson's commentary is perhaps itself artisan: he allows it to brew within the reader on its own time. By the end, you realize you've been invited to slow down and really appreciate what's been made.